I’ve had a Yaesu G-800SA Rotor on my tower since I built it in 2009. I mostly like it, especially the nice big dial on the controller. The fact that it only needs 4 wires to operate is also a plus. 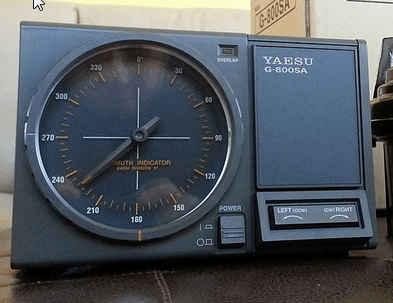 One thing I don’t like about this Yaesu Rotor is that it’s very cold blooded. I tend to take a bit of time off work over the holidays, so I like to mess around on the ham bands. Unfortunately, here in Iowa it’s often quite cold outside at this time of year. Today, for example, overnight we had a low of -4°F, and as of lunchtime it’s only reached 10°F. It seems that when the temperature is cold, below about 10°F, the rotor stops turning. I haven’t yet been able to determine if this is a rotor issue, or some other problem related to my installation. I’m not very inclined to climb the tower when it’s cold out to see where the issue lies! I’ve been pondering if there’s a way I could warm the rotor up a little bit, assuming I determine the issue is in the rotor. Or maybe it needs a different type of grease more suited to the cold Iowa winters. In any case, while typing this post the rotor warmed sufficiently that I now turns. Time to check out the bands!